On Sunday 13th July 2014, Walk for Wards took place in Perranporth, raising money for the Royal Cornwall Hospital's Trust Charitable Funds. Walk for Wards is part of a national initiative and at RCHT was used to raise funds for the Royal Cornwall, St Michael’s and West Cornwall hospitals. Walkers were able to raise money for individual wards, departments or RCHT’s general charitable fund. 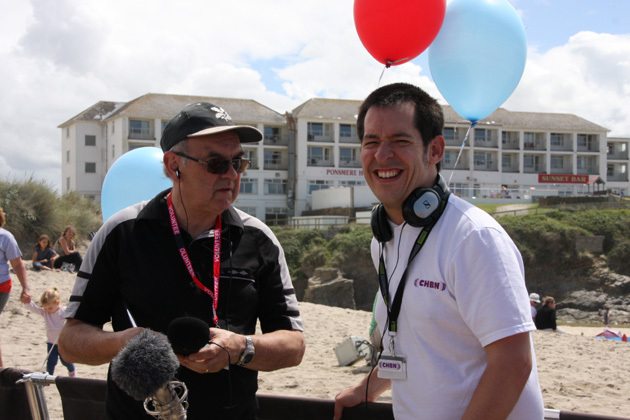 The three-mile walk started and ended at the Watering Hole on Perranporth Beach and was supported by many departments and staff from within the hospital's trust together with local people who were keen to support their local hospital. Peter Dowsett and Mark Sanders from CHBN attended (see picture) and collected interviews with those organising and taking part in the successful event.